We’ve heard quite a lot about the Sony Xperia Z3 in the past couple of weeks. From components of the flagship smartphone to its specifications, one thing that was clear was that the Xperia Z3 would differ only in terms of design and not specifications from the Z2. Well, today benchmarks have appeared on the GFXBench website for a Sony flagship. The name of the device on the site is D6603 and the specs are almost entirely similar to the Xperia Z2. The specifications that have appeared on the GFX Bench site show that the Xperia Z3 will not be upgrading from the Xperia Z2 in the performance section. 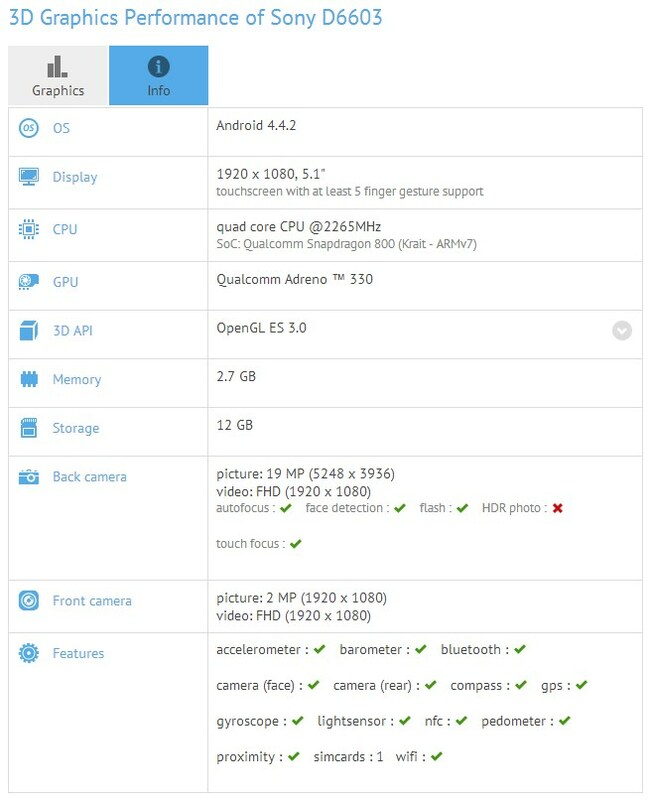 Sony D6603 on the GFXBench site has a quad-core Snapdragon with 3 GB of RAM. This is coupled with a 20 MP camera and 12 GB of internal storage. All of this of course fits perfectly with previous leaks of the device which also alleged that the Xperia Z3 will be a minor upgrade from the Z2. However all the Sony fans out there shouldn’t be disappointed just yet. The Sony Xperia Z3 will not be the same phone as the Z2. The device will not only see a thinner form factor but will also have several other upgrades as well. These include an overall curved design as well as perhaps the presence of Sony’ new camera sensor on the Xperia Z3. This will end up further boosting the photographic abilities of the device, which is a section in which it already has impressive features. So stay tuned for more folks, and wait for September.